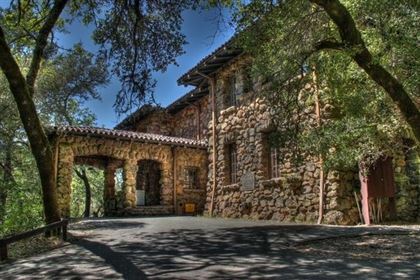 Jack London State Historic Park covers 1400 acres of pristine Sonoma County Wilderness. Twenty plus miles take the traveler to breathtaking views of the Valley of the Moon, Jack London’s agricultural experiments, and vineyards. The park contains a completely restored cottage and garden where Jack wrote a number of novels. It also is home to several historic ruins: Wolf House, Jack and Charmian's dream home that tragically burned down the evening before they were to move in, the winery ruins, barns, and the Pig Palace. On the east side of the park the House of Happy Walls is a beautiful, large stone building, currently a museum. Click here for additional info.